Cy5-ProTx-I (Protoxin 1; β-theraphotoxin-Tp1a) is a fluorescently labeled ProTx-I that was originally isolated from the venom of Thrixopelma pruriens (Peruvian green velvet tarantula). This toxin reversibly inhibits the tetrodotoxin (TTX)-resistant channel Nav1.8 (IC50 = 27 nM) and Nav1.2, Nav1.5 and Nav1.7 with IC50 values between 50 and 100 nM. 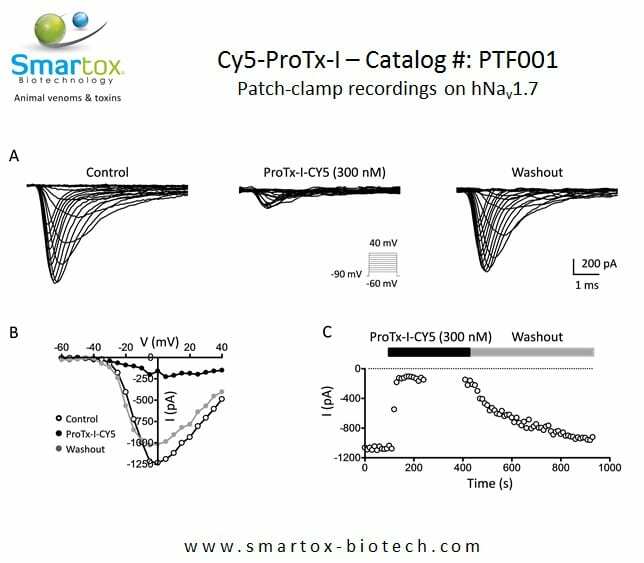 Furthermore, ProTx-I shifts the voltage dependence activity of T-type Cav3.1 channels (IC50= 50 nM) without affecting the voltage dependence of inactivation. ProTx-I is a valuable tool to discriminate between Cav3.1 and Cav3.2. ProTx-I is also an antagonist of TRAP1. Product code: PTF001. Category: Sodium channels. Tags: protox, protoxin, protx, protx-1.